Your lips are some of the most sensitive and exposed skin on your body. The skin is thin and lacks the outermost layer of stratum corneum which usually protects the epidermis. Whether it's dry winter air, exposure to the elements, or air travel, a simple lip balm can go a long way in making your lips more comfortable and less prone to cracking or bleeding. The good news is lip balms have evolved from the days of simply smearing Vaseline, Chapstick or Carmex onto your lips. What is a Lip Balm? First off, don't confused lip balms with lip gloss. Lip balms are typically clear and only leave the slightest sheen on the lips. They are designed to hydrate the skin rather than have a cosmetic effect. When Should You Use Lip Balm? Lip balms are best used preventatively — don't wait for your lips to start bleeding to dig one out. You can apply as needed when your lips first feel dry or nightly as a preventative measure. They're inexpensive, small, and easy enough to keep in a pocket, at work or in your gym bag. Lanolin: Wax secreted from woolly animals such as sheep. It protects the skin barrier and softens it. While it has been shown to be more effective at treating dryness than either petroleum or glycerin, it is also unfortunately a relatively common allergen. Beeswax: Natural wax produced by honey bees. It is humectant, attracting water to it while also creating a protective barrier on the skin. If you have sensitive skin, the natural antibacterial and anti-allergenic qualities of beeswax would make it a good choice. Shea butter and cocoa butter: Plant-based butters (from the nut of the shea tree and cocoa bean respectively). Shea butter melts at body temperature, absorbing quickly into the skin, and has good water-binding qualities. Cocoa butter melts at slight below body temperature, has an emollient on the skin and contains natural antioxidants as well. 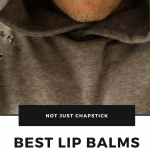 If you're looking for a vegan or plant-based option, try these ingredients in the best lip balms for guys. My personal favorite lip balm for winter and the one I recommend for my patients is the EltaMD UV Lip Balm Broad-Spectrum SPF 31. It is great for moisturizing and also offers UV protection to guard dry, chapped, and sun-exposed lips. My favorite lip balm is dōTERRA’s Spa Lip balm because it’s essential oil based and not petroleum or wax based. Anything you put on your lips or skin you ingest and I don’t want to ingest petroleum or wax! It doesn’t leave my lips looking like I smeared grease all over them and doesn’t leave a caked on feeling either. In my line of work, I might find myself outside in the elements for extended periods of time and dōTERRA’s lip balm definitely comes in handy. arsenal of lip balm homemade and bought to combat the chapped lips. Oribe Balm Essence Lip Treatment rescues my lips during travel or after too much sun. It goes on slightly waxy but once it settles, I don't need to reapply like many balms I've tried. I love Mary Jane’s Medicinals Lip Bong because of its natural ingredients, smooth application, and pepperminty scent. Being infused with cannabis is an added bonus that helps with chapped lips from long winter runs or skiing. My favorite is the Black Cherry Lip Balm from a Brooklyn-based company called The Fanciful Fox. The company is 100 percent vegan - they don't use any animal-derived ingredients such as beeswax and lanolin (sheep wool grease) that you sometimes find in lip balms. That's why I love them. I use Lip Recovery by Pharmagel because the shea butter helps prevent drying on my lips. I also really enjoy the healing properties that the Aloe Vera gives me. That’s why I never leave home without it. I really like the Burt’s Bees Limited Edition Pumpkin Spice lip balm. This time of year, pumpkin-flavored everything is everywhere, but unless you are going to spend $10 on a coffee at Starbucks or eat your weight in pumpkin-spice donuts, pumpkin is really limited to Thanksgiving, and then only if you live in one of the northern states. In North Florida, instead of Pumpkin Pie, people serve sweet potato pie, and while I like both, growing up in Virginia means I still like pumpkin pie more. So the Pumpkin Spice lip balm was the best way for me to not go broke buying Starbucks, not break the scale eating pumpkin flavored donuts, and not miss out on the flavor because of all the sweet potato pie during an 80-degree Thanksgiving. The best lip balm I’ve found out there comes from Zi Zai Dermatology in Fort Collins, CO. It’s called Lipintervention. It’s handcrafted with Chinese Herbal Medicine. Love the stuff because I only use it when I need it. And I don’t have to worry about creating an addiction cycle. This stuff does the trick! A little healthy moisturizing can go a long way - especially if you use one of the best lip balms for men highlighted above. While you're at it, don't forget the rest of your face. Find out what facial moisturizer is best for your skin type.